Detroit will play eight-game exhibition season, including four at Little Caesars Arena. The Red Wings will open their exhibition season with a home game Sept. 19 against Pittsburgh. 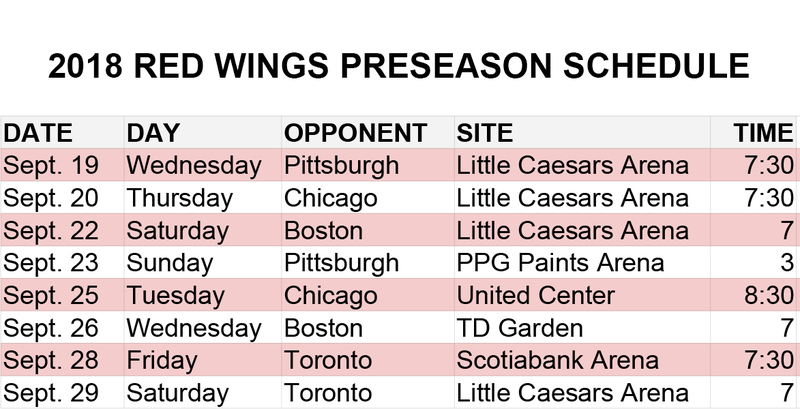 The Wings released their exhibition schedule Friday — the regular season schedule will be released Thursday, with the home openers revealed the day before. The game against Pittsburgh begins a stretch of three home games in four days in the eight-game exhibition schedule. The Wings also host Chicago, Sept. 20; and Boston, Sept.22. The Wings then travel for four road games in a six-day span, visiting Pittsburgh, Sept. 23; Chicago, Sept. 25; Boston, Sept. 26; and Toronto, Sept. 28. The exhibition season concludes with a home game against Toronto Sept. 29.